Yesterday, at about the same time I was penning this article describing how CO2 levels were likely to exceed 400 PPM for most of 2015, a rather significant and abrupt CO2 spike was taking place at the Mauna Loa Observatory. 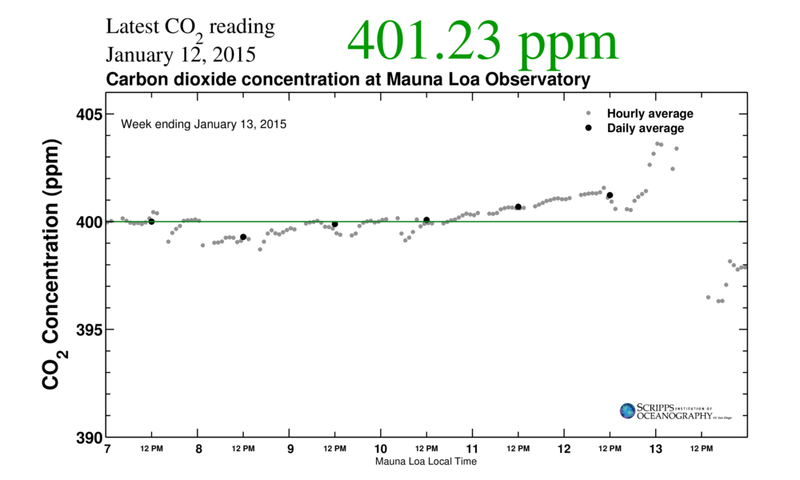 For on the evening of January 13, 2015, CO2 levels suddenly rocketed to nearly 404 parts per million. The sudden upswing was certainly unexpected and rather significant — mimicking only the highest levels during 2014. These spikes came fully four months ahead of typical atmospheric CO2 peaks and seem rather ominous in the graph. CO2 levels can be variable in the hourly measure. But this inflection was particularly strong — following a very high daily reading of 401.23 PPM on the 12th. Somewhat odd and rather early CO2 increases for 2015. A trend we will have to continue to watch. Possible. Usually they blank those out. I’ve seen inflection patterns like this one before. But this is probably the greatest magnitude. There were some statements about the measure growing more variable last year. I can’t see any major system move through the area during that period. But in general I wonder if the greater atmospheric perturbations on all levels that we expect from GW will make readings at once relatively pristine sites look more and more erratic. Looking at the models of CO2 swirling around in the atmosphere, this does seem to be the case. The region is experiencing strong meridional flows beneath a zone where the storm track is blocked and essentially looping back on itself in queue. Alarming warning: I kept copy 19th April 2014 spurt to almost that level: Do storms bring down CO2 & Methane veils up there? Is that the explanation for the gap below 400 ppm in that time? I long to learn more about health, the acidification of the sea. The movement of the sea. How still does it become? That’s a good question, Diana. Models have shown CO2 wave fronts ahead of some weather systems. So that’s possible. As for the oceans, yes, a hothouse ocean would, in the end, be quite still and oily black in many places. But we’re still well always from that at the moment — even though the oceans are growing more stratified. As for acidification — we kill off most calcium carbonate based organisms by mid century under current and expected rates of burning. The carbon sinks are failing. Forests are dying off, primarily from ozone pollution followed by opportunistic biotic pathogens – and they are not absorbing as much CO2. This is going to contribute to quite an increase in levels measured in the future. The growth of rooftop solar and the increased uptake of energy efficiency account for nearly all of the reduced demand in the Australian electricity grid in the last year, according to a new report. Anecdotally, there seem to be a good deal of folk who are simply fed up with the energy politics and deciding to go off grid entirely. SA seems to be the one region in Australia that is preparing to optimize the grid for renewable energy services. I’m glad we have this Pope. But I think he needs to join with 10 other Bishops in supporting a divestment from fossil fuels. The Pope should publicly support fossil fuel divestment. I wonder , what is his email address ? I can’t believe we are even dealing with a Pope that sees these things. Galileo Galilei is rotating in his grave. Some areas were deluged with a month’s worth of rain in 24 hours, said the BBC’s weather report. For scientists concerned about the fate of the Arctic ice cap, one of the most important things to keep track of is the amount of ice that survives the summer. A new video shows how, despite growth during some years years, we’re progressively losing this mature, thicker ice. Published on Jan. 12 by NASA’s Science Visualization Studio, this video tracks perennial sea ice from 1979-2014. To get a complete picture of multi-year ice, researchers had to carefully analyze their imagery day-by-day, and section-by-section. This is because different parts of the Arctic reach minimum sea ice at different times, and floating ice has a tendency to move.